The UK has struck a deal with the US to preserve £12.8bn of trade after Brexit. The mutual recognition agreement replicates the current deal between the EU and US on technical standards for exported goods. US President Donald Trump said the "very good trading relationship" between the countries had been "strengthened further". And International Trade Secretary Liam Fox said it would allow firms to "keep trading as freely as they do today". Earlier this week, Mr Fox came under fire for failing to ensure businesses trading overseas would be unaffected if the UK left the EU without a deal. In that scenario, British companies would no longer be able to trade on the preferential terms the EU has agreed with about 70 countries. Reality Check: What trade deals has the UK done? No deal: What does a 'WTO Brexit' mean? The government said it wants to replicate these agreements "as far as possible". But Labour's international trade spokesman, Barry Gardiner, told MPs that "precisely four" free trade deals had been signed, despite a promise that 40 would be ready immediately after Brexit. Mr Gardiner said he understood talks on 19 other deals were "significantly off track" and that "two are not even being negotiated". The UK-US agreement is not a free trade deal - which can relax trading rules, reduce taxes (tariffs) on imports and exports, and grant easier market access. However, the government says it will benefit a range of sectors, including tech, telecoms and pharmaceuticals. The latter accounts for £7.7bn of exports to the US - about 18% of the value of all goods. Mr Fox said: "We look forward to sitting down at the negotiating table with the Americans after we leave the European Union, to strike an ambitious new free trade agreement." 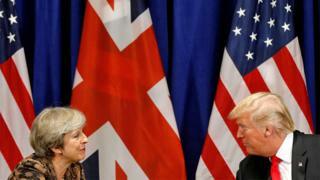 The US ambassador to the UK, Woody Johnson, also welcomed the news, saying Washington was "determined that US-UK trade will continue to flourish". On Monday, the UK signed a "continuity agreement" to preserve the terms of the EU's free trade deal with Switzerland, covering some 15,000 British exporters and £32bn in trade. It has signed similar agreements with Chile, the Faroe Islands and the Eastern and Southern Africa bloc. President Trump indicated in 2017 he was working on a "major trade deal" with the UK which could be "very big and exciting" for jobs. However, he suggested last year that the agreement Theresa May struck with the EU could prove detrimental to that prospect.